These flame heads burn with a constant flame up to 2m. They are a discrete flame effect which can be lit remotely (wired) perfect for stage use during a song or theatre performance. 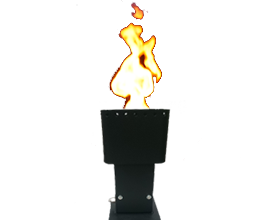 Designed & created by us to be able to provide a remote (wired) continuous flame system, this is compact unit perfect for the front of a stage. Designed for use on stage this flame head can be switched on & off at the touch of a button to create a simultaneous ignition across a number of units. This low voltage system can be used safely outside or inside with propane gas. This effect can come with optional stand.